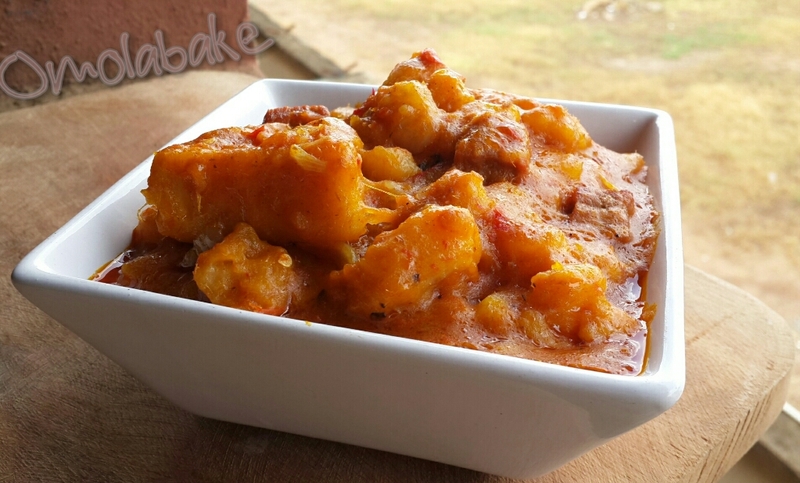 Growing up i was not a huge yam pottage fan , most people call it yam porridge . My dad cooks the best yam pottage, he made me like it. Well maybe because the man would nearly finish all the ingredients in the pantry that was meant for four pots of soup into one pot of pottage. 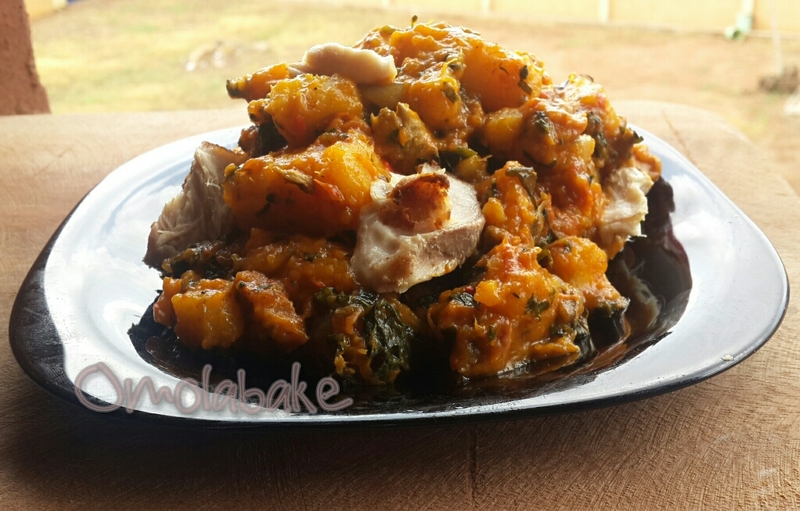 Before I cook yam pottage, the yam has to be right, and by right I mean it has to be the variety that crumbles when you pierce it with a fork when it’s cooked, sweet and preferably white Yam. I like my yam pottage to have some broth and chunky pieces of yam so I eat it with a spoon -squishy and chewy-. 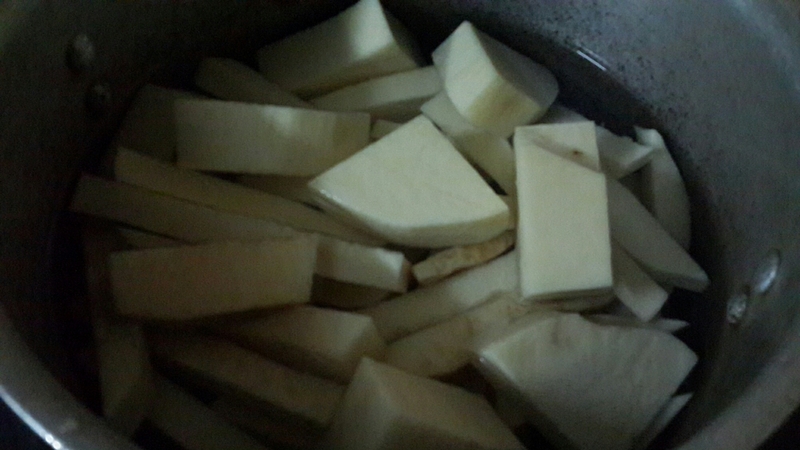 I really love to have vegetable in my pottage, le hubs doesn’t really care for vegetable so I add mine separately. 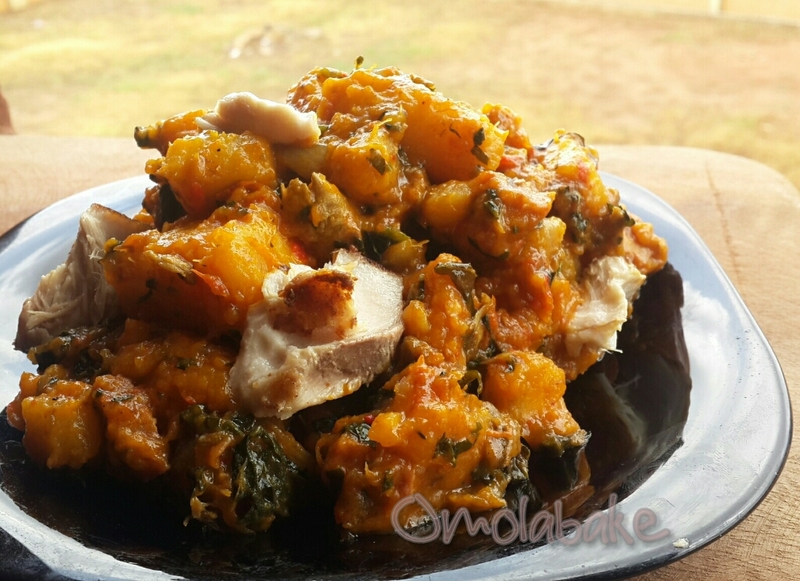 – Peel, wash and cut yam into chunks. 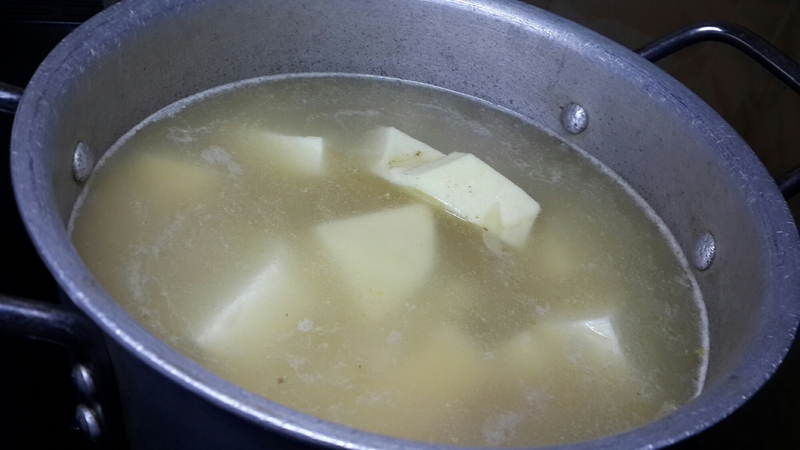 Add some water, salt, bouillon cubes and if you have meat stock, add the meat stock. I’ve found that yam cooked in meat stock yields great tasting yam pottage. 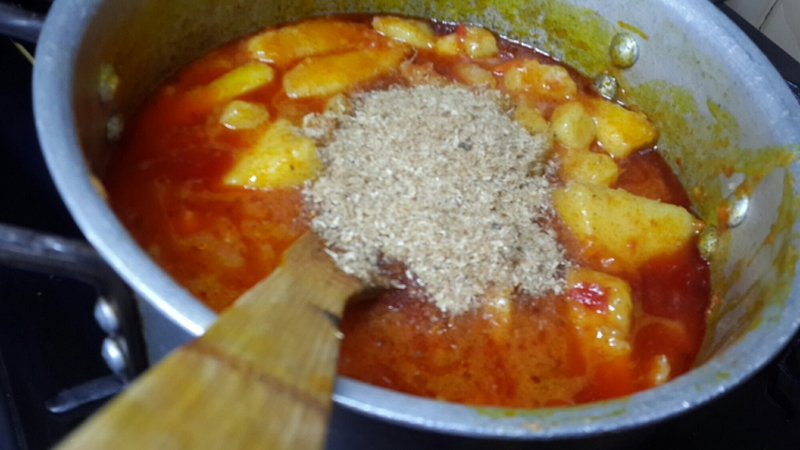 – When the yam is cooked (you can pass a fork through )add palm oil, blended pepper, powdered crayfish. If you need to, you can add more water but be careful not to add too much. – Add your bits of precooked meats, fish, egg or fresh prawns . – Stir all together and Cook on medium heat still all the ingredients are well incorporated and the broth has a slightly thick consistency. – *If adding vegetable, add just before you turn off the heat. This is so as not to over cook, the heat would cook it through even after the heat has been turned off. Yum!! 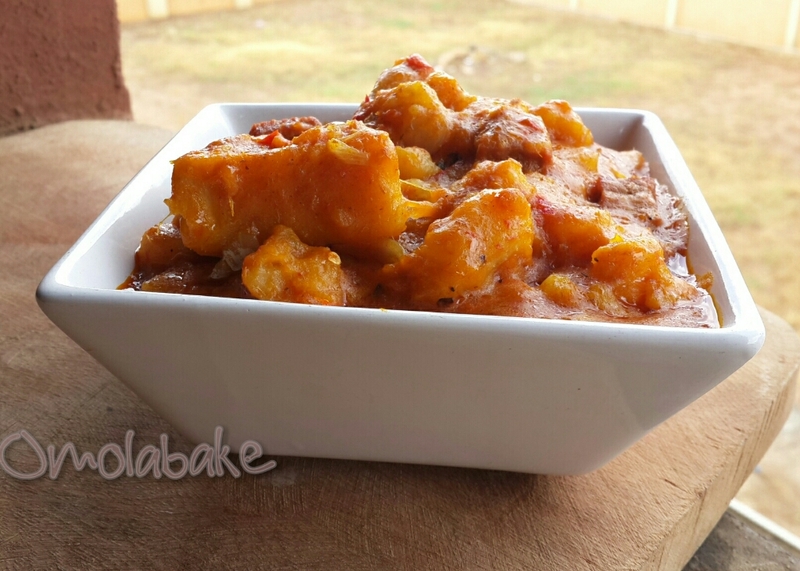 I loooove me so asaro! I cook mine a little different but with same ingredients except i use canola oil instead of Palm oil. I fry my peppers in the oil, season well, add boiling water and let the broth boil a little, add my small chunks of yam and let the yam boil inside the pepper broth. I’m a dried fish fanatic (i put dried fish is EVERYTHING), just before the yam softens perfectly i add my chunks of pre soaked dried fish. The heat in on medium once the yam goes it to all it cook a tad slowly and absord the broth and flavors. Voila- all done! Going to use your method next!! *Once the yam goes in, to let it cook. Very well done! I have followed you discreetly for a while and I admire your passion for food etc. I am quite intrigued on the contents of the second plated picture. I can’t quite make out what the creamish stuff is. Looks likes paneer or sliced baguettes. Just intrigued. Keep on the good work. All the best. Thanks for the kind feed back. Apologies for the delay in response. The creamish stuff is fish flakes. Hake I think.